Recently at dinner my father instructed me, “tell your website readers that your dad says this is a good one.” Done, dad. This chicken is good—perfectly tender, well flavored, crunchy—just what one wants in fried chicken. Buttermilk is lightly acidic. Soaking the chicken overnight in buttermilk helps tenderize it, and the chicken stays tender when you fry it. It’s helpful to use a high smoke point oil when frying chicken. We use rice bran oil or peanut oil, both of which have high smoke points. They can take being heated to the high temperature needed in frying without smoking or burning. Many recipes call for frying chicken in a cast iron frying pan. Sometimes we use one of our trusty cast iron pans, and sometimes a hard anodized aluminum pan. Cast iron tends to be quite heavy. It retains heat so well that if you have a problem and have to lower the heat rapidly, you won’t be able to do it. Here’s a tip on checking oil temperature. I have this perfectly justifiable fear of hot oil. 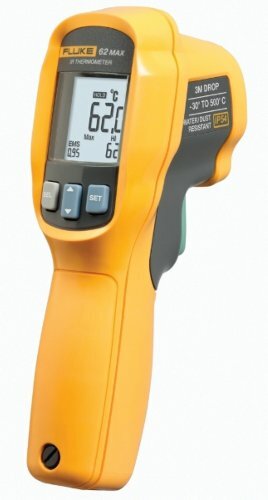 So to measure it without getting too close to it, I use an infrared thermometer like this one. Just point the thermometer at the hot surface of the oil, pull the trigger, and you’ll get a fairly accurate readout of the oil temp. Hello! All photos and content are copyright protected. Please do not use our photos without prior written permission. If you wish to republish this recipe, please rewrite the recipe in your own unique words and link back to Buttermilk Fried Chicken on Simply Recipes. Thank you!